When every student in the room is smiling during a lesson, you know you’re firing on all pistons. Maybe. It was 2010, and I was experimenting with Google Docs. My ROWDY juniors were unusually engaged during my fascinating mini lecture on MLA parenthetical citation. My jokes were landing, there was laughter, and I was feeling pretty good about myself as an instructor. Actually, all of them were thoroughly engaged with the chat feature on the right side of their screens. And the chat was about a classmate’s sister’s reputation. They had their laptops open, and everyone was on a document I had shared with the class. So much for my fascinating mini lecture. Because I was an early adopter, I had to learn classroom uses for Google Docs through trial and error. What I loved then and love now is the ability to collaborate in real time while the thinking is happening. Bell Ringers: Students get a prompt at the beginning of class that hooks to skills or content learned in the previous lesson. They demonstrate their knowledge while also using a prescribed writing skill. For example, students might have to explain character motivation using only compound and complex sentences. They all give the document a common title (like “General Zaroff Bell Ringer”), share the document with me, and we’re done. No paper, little prep. have no more than four students on the same document. If there’s any lag, there will be some brief down time. Better two students with down time than 29. I assign the groups and team leaders, and the team leaders create the documents and share with the other members of the group and with me. The prospect of being visited unannounced is a great deterrent against shenanigans. Color Coding: I teach literary analysis through color coding. Concrete details are blue, and analysis is red. The topic sentence, the primary argument, is red, so all supporting analysis should be red as well. I use Google Docs to have students either draft in color or check their balance of detail and elaboration by adding the colors in the editing process. Learn more about my color coding system in Literary Analysis for Every Student. Conferring/Conferencing: While both teacher and student are online, sit side-by-side and talk out one issue. Remember this mantra: You can’t steer a ship that’s not moving. Require that a student comes to a conference with something written. On rare occasions, I confer remotely. When I’m home sick or sitting bored to death in a hospital waiting room, I hop onto Google Docs live to see what’s happening in my classroom. Students can ask me questions, and I can find out if the sub sent someone out to get Krispy Kreme (Yes, that actually happened.). Got laryngitis? 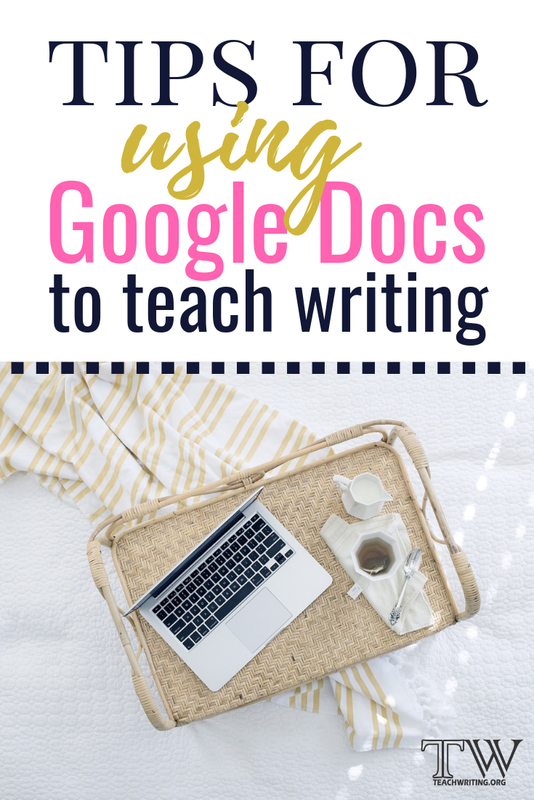 Use Google Docs as a workaround. Handouts/Guided Notes: Save a tree and give handouts or instructions via GD. I put sub assignments online. That way, I know that they got the assignment I intended for them to get. I even include the links to websites students may need for the assignment. Differentiation: This method of modifying work takes a bit of time but is well worth it for students with accommodations. If work is being done with a sub, I have students highlight what they accomplished so that I know where to start when I get back. Pull ESL, EC, and student teachers into the fold by having students share documents with them. Give clear parameters for on-screen chats between students. Discussion must be brief and relevant. Consider only allowing questions directed at students who are engaged in writing. Verbal questions would interrupt work flow, so the written version sticks a pin in an urgent question until the writer is finished with her thought. Keep the screens visible. With small classes, a circle works well. The teacher can easily walk and monitor. In larger classes, have two classroom positions that allow viewing of screens. In other words, the teacher should be able to see half the screens at a time. Avoid the pitfall of thinking that on-screen online work through a Google platform constitutes automatic engagement. It doesn’t. It can be powerful, however, if used deliberately with clear boundaries for students. 21st Century Writing: Are Instagram Captions a Genre Now? Angie Kratzer is a high school English teacher in central North Carolina, and she holds Secondary ELA and K-12 Academically Gifted certificates. In 2001 and 2011, she earned her Adolescent/Young Adult Literacy certificate from the National Board for Professional Teaching Standards. Her experience includes 18 years in the classroom and three years as a curriculum specialist for 6th through 12th grade English Language Arts. She also serves school districts as a consultant and trainer in writing instruction. If you have questions about any of her products, contact her at angie@angiekratzer.com. If you’d like to stay in touch, sign up here to be on her mailing list.